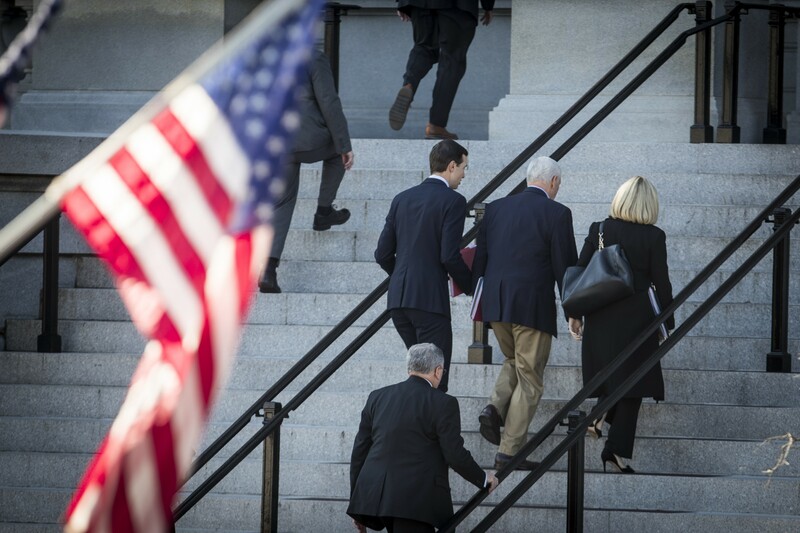 From left: Jared Kushner, Vice President Mike Pence and Homeland Security Secretary Kirstjen Nielsen enter the Eisenhower Executive Office Building for a second day of negotiations on border security and the government shutdown, in Washington, Jan. 6, 2019. WASHINGTON — The Trump administration will direct the Internal Revenue Service to issue tax refunds during the ongoing federal government shutdown, reversing previous policy, officials said Monday. “Tax refunds will go out,” Russell T. Vought, acting director of the White House Office of Management and Budget, told reporters in an afternoon briefing. The move seeks to circumvent a potential political problem for the Trump administration by allowing taxpayers to claim refunds despite the government shutdown, which is already dragging into Day 17. Millions of taxpayers who typically file for refunds at the beginning of the year have been unsure when they will get their money back from the IRS. Under previous shutdown plans — and interpretations of federal law — the IRS was prohibited from dispensing tax refunds when Congress has not approved money to fund the Treasury Department, as is the case now. By Feb. 2 last year, the earliest point in the IRS’ 2018 statistics, 18 million individual returns had been filed with the agency. The IRS had issued more than 6 million refunds, totaling $12.6 billion — an average refund of $2,035. The agency issued more than $324 billion in refunds for all of 2018. Democrats have criticized the administration over the shutdown and its potential to delay refunds. Administration officials have been looking for ways to ensure refunds could go through, even if President Donald Trump and congressional Democrats fail to resolve their dispute over whether to fund construction of a wall on the United States’ southern border. Democrats on the House Ways and Means Committee said they began to see indications over the weekend that the White House was looking for a legal justification to reverse existing policy and allow refunds to be issued. But committee lawyers believe the law prohibits such a move, because refunds are paid out of the government’s general fund. Committee staff said Monday they were struggling to get clarity from administration officials, many of whom are out on furlough.